The state of Pakistan is now poised for a change, as predicted by many in the context of the General Elections held on 25 July. Though Pakistan Tehreek-e-Insaf (PTI)’s victory is not decisive, there is a general feeling that given the lead in the race, PTI under the leadership of Imran Khan will form a government. The provinces will also witness changes in political dispensation. The results show a clear verdict against the PML-N led by Nawaz Sharif and the PPP led by Bilawal Bhutto. With Nawaz Sharif and his daughter Maryam in prison, in the wake of the Panama episode and court verdicts, the election campaign witnessed intense debate on corruption and, predictably, the popular verdict had to swing in favour of Imran Khan’s PTI, which has already been running a provincial (coalition) government in the Northwestern Khyber Pakhtunkhwa. Though there are widespread allegations of corruption and rigging, Imran Khan threw down the gauntlet to his opponents and assured in public that it could be investigated. During the campaign for a much hyped “Naya (new) Pakistan” Imran Khan had promised that his party would create 10 million new jobs and build 5 million homes for the poor if they win. He also made a claim that the rich Pakistani diaspora had assured him that they would step in with substantive investment and expertise to reconstruct the country. In his first press conference (even as the entire election results were still to be announced), Imran Khan announced that he wanted Pakistan to become the country that his leader “Quaid-i-Azam Muhammad Ali Jinnah had dreamed of” (Dawn 2018b). He said that he wanted to “share the kind of Pakistan” he envisioned—“the type of state that was established in Madina, where widows and the poor were taken care of “(Ibid). If it i was Nizam-i Mustafa (the system of the Prophet Muhammad) that Imran referred to, there was already an experiment undertaken by a nine-party popular movement begun by the Jamaat-i Islami in 1977 to overthrow the secular government of Zulfikar Ali Bhutto and establish an ‘Islamic system’ of government in Pakistan. The movement broke done after the military coup of Zia-ul-Haq and, then, Pakistan witnessed another decade of authoritarian military rule under the facade of ‘Islamisation’ drive. “You are free; you are free to go to your temples, you are free to go to your Mosques or to any other places of worship in this state of Pakistan, You may belong to any religion or caste or creed – that has nothing to do with the business of the state… we are starting in the days when there is no discrimination, no distinction between one community and another, no discrimination between one caste or creed or another. We are starting with this fundamental principle that we are all citizens and equal citizens of one state… you should keep that in front of us as our ideal, and you will find, in course of time, Hindus would cease to be Hindus, and Muslims would cease to be Muslims, not in the religious sense, because that is the personal faith of each individual but in the political sense as citizens of the state (Jinnah 1947). Does PTI’s “Islamic Republic” allow room for such an egalitarian society? What is the status of minorities in Pakistan even after 70 years? The Ahmadi community, for instance, announced their boycott of the July 25 elections to protest the ‘discriminatory’ move to have a separate voter list for them. Imran did not hide his bias on their status. He had openly rejected any idea of repealing the Second Amendment to the Pakistani Constitution which declares the Ahmadis as non-Muslims. In his first press conference, Imran brought to light the plight of the poor, women and children. He says: “Farmers are not paid for their hard work, 25 million children are out of school, our women continue to die in childbirth because we can’t give them basic healthcare, we can’t give the people clean drinking water. A country is not recognised by the lifestyle of the rich, but by the lifestyle of the poor. No country that has an island of rich people and a sea of poor people can prosper” (Dawn 2018b). It may be recalled that in a pre-election interview Imran said that “The political class here doesn’t change that much. You can introduce new actors but you can’t change the political class wholesale. This is why I give the example of Mahathir Mohamad, who changed Malaysia with the same political class by giving them clean leadership” (Dawn 2018a). This was obviously an indication that Imran’s PTI does not envisage any fundamental change in the political economy of the State of Pakistan. The ruling political class has always been characterised by a combination of military-bureaucratic-political forces. There is already a feeling everywhere that Imran and his PTI could be the natural ‘selection’ of the military. Given such a spate of criticisms across a wider political spectrum, within and across the world, it remains to be seen how he would negotiate between these state apparatuses. In an interview Imran was asked to speak on the military’s influence in setting Pakistan’s foreign policy. He said: “The army will get involved where there are security situations. If you look at the US policy in Afghanistan, a lot of the US-Afghan policy was influenced by Pentagon. Even when Barack Obama didn’t want to continue the war in Afghanistan, he did it because he was convinced by Pentagon” (Dawn 2018a). 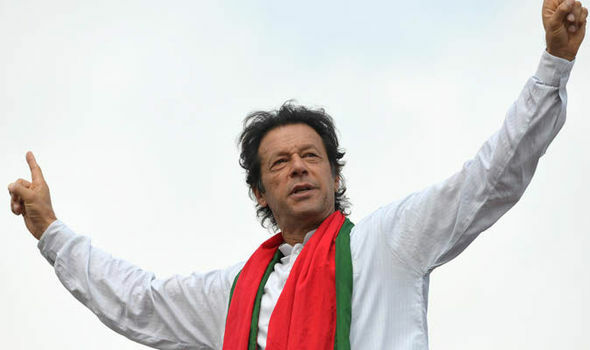 Imran also said: “When you have democratic governments that perform and deliver, that is their strength. We have had military influence on politics in Pakistan because we have had the worst political governments. I am not saying it is justified but where there is a vacuum something will fill it.” He also said: “Under crooked and corrupt governments, people welcome the military with open arms. In 1999 when Musharraf’s martial law was declared, people were celebrating in Lahore – Nawaz’s political centre! – because governance had failed” (Dawn 2018a). Imran has also been criticised for his ambiguous position on Islamic forces in Pakistan. Many even suspected if he was ‘soft’ on such issues. During the election campaign, he declared that there should be “a dual policy: one is dialogue and the other is military action. I have been labelled ‘Taliban Khan’ just because I did not agree with this one-dimensional policy that Pakistan implemented under American pressure.” Imran said: “the war in Afghanistan was a classic example of how military solutions alone did not work. “The US has been there for 15 years with a military option but has failed. If there is consensus among the American and Afghan governments and allies that they want unconditional peace talks with Taliban, it means the military option has failed” (Dawn 2018a). The most challenging test of Imran’s policy regime could be Pakistan’s relations with India which witnessed a setback during the last few years. His anti-India rhetoric had already raised suspicions that a political dispensation under Imran would be more ‘aggressive’ in dealing with India. In the interview with Dawn, he said that his rival “Nawaz Sharif tried everything, even personal [gestures] calling him [Modi] over to his house. No one got in his way. But I think it is the policy of the Narendra Modi government to try and isolate Pakistan. They have a very aggressive anti-Pakistan posture because Modi wants to blame Pakistan for all the barbarism they are doing in Kashmir. What can one do in the face of this attitude?” (Dawn 2018a). In his post-election speech, Imran, however, appeared to be more soft-spoken though he still harped on sensitive issues like Kashmir. He said that it would be “very good for all of us if we have good relations with India. We need to have trade ties, and the more we will trade, both countries will benefit”(Dawn 2018b). Everyone knows that it was Pakistan that was still hesitant on the issue of strengthening trade ties with India. It is yet to accord the most favoured nation (MFN) status to India even as it maintains a negative list of more than a thousand items which are not permitted to be imported from India. New Delhi keeps reminding that its granting of MFN status to Pakistan should not be treated as a mere gesture and hence reciprocity is called for. Referring to Kashmir, Imran said that “Kashmir is a core issue, and the situation in Kashmir, and what the people of Kashmir have seen in the last 30 years. They have really suffered…Pakistan and India’s leadership should sit at a table and try to fix this problem. It’s not going anywhere.” In a more conciliatory tone Imran said: “We are at square one right now [with India]. If India’s leadership is ready, we are ready to improve ties with India. If you step forward one step, we will take two steps forward. I say this with conviction, this will be the most important thing for the subcontinent, for both countries to have friendship” (Daily Pakistan 2018). A major question is if Pakistan will allow the democratic process to take the lead on both sides of Kashmir. Azad Kashmir is still a democratic-deficit zone which Imran does not want to concede when he talks about issues in the Indian administered Jammu and Kashmir. One major cause of the perennial crisis in Kashmir is the continued support the militants get from Pakistan which India considers as a critical factor stalling the peace process. The most crucial tests of Imran Khan would be his handling of Pakistan economy and the burgeoning threats from Islamic forces. The economy has already been facing several problems—from resource crunch to worsening balance of payment situation. The International Monetary Fund (IMF) has already warned that “the current account and budget deficits are gloomy.” According to the IMF, the country’s current account deficit stood at 4.8% of total national income ($16.6 billion), which was 83% higher than the government’s official estimates. The IMF has also warned that Pakistan’s official gross foreign currency reserves could fall to $12.1 billion–barely enough financing 10 weeks of imports. The IMF also asked Pakistan to improve its anti-money laundering and counter-terrorism financing regimes. They also sought to devalue the currency to minimise damages to the external sector, and levy more taxes to control the growing budget deficit. It said that surging imports have led to a widening current account deficit and a significant decline in international reserves despite higher external financing. FY 2017/18’s current account deficit could reach 4.8% of GDP, with gross international reserves further declining in the context of limited exchange rate flexibility. This is equal to $16.6 billion – and far higher than $12.1 billion deficit that Pakistan has experienced in the previous fiscal year (IMF 2018). The Fund-Bank estimates have a particular importance for Pakistan given its long-term dependence on the external sources and its high spending on defence and arms build-up, besides its financing of various forces. Remittances constitute a major share of Pakistan’s foreign exchange. According to latest reports, remittances have declined by 19.82% compared to the situation the previous year (it was $1.609 billion in September 2016 but in 2017, it has been reduced to $1.29 billion) (Times of Islamabad 10 March 2017; Dawn 10 June 2017). Like other countries in South and Southeast Asia, Pakistan too will have to bear the burden of declining remittances due to the localisation drive underway in the GCC countries. Most importantly, Imran has to address the situation arising out of the rise of terrorism and fundamentalism in Pakistan. He must be aware that it has much to do with the emergence of an oligarchic power structure (civil-military-religious nexus), which had its beginnings in the 1960s, but got accentuated in the 1970s after General Zia-ul-Haq came to power((Seethi 2015). It was during the rule of Benazir Bhutto and Nawaz Sharif in the 1990s that the Islamic forces like Taliban branched out, within and across the boundary in Afghanistan. An major factor that has significantly assisted their growth is the making of a vast number of jobless families, people without any means of existence and without expectations, as a consequence of lopsided policies in agriculture and industry. As Hamza Alvi wrote, every tractor displaced at least a dozen families of sharecroppers. Hundreds of thousands of them were without a source of livelihood. Under these circumstances, the advent of the well-financed madrasas, who took over their children, gave them free tuition, accommodation and food, appeared to be a great miracle (Alvi 2010). Over years, the armed groups, many of them with battle-hardened Taliban, are in the forefront of a sectarian carnage in Pakistan, which have been on the increase — killings of members of rival sects, Sunnis vs Shias, Deobandi Sunnis vs Barelvi Sunnis, etc. (Seethi 2014). Over the years, these militant bands assumed new forms and carried new nomenclatures. Islamic militant outfits such as the Tehreek-e-Taliban Pakistan, Lashkar-e-Toiba, Lashkar-e-Jhangvi, Jaish-e-Mohammed are various forms of Jihadism in the making, seeking to take over the State by military means, mainly relying on the discontent of the middle class. Instead of conceptualising a workable policy with a view to dealing with such militant groups, successive governments have pandered to them. The high cost of this great lapse is that Pakistan has become the killing fields of South Asia. In Pakistan, the State’s monopoly of force is dented by a variety of armed Islamist groups that have schemes of their own. The ruling dispensations have not so far recognised that the more they try to acquiesce to these religious extremists, the harder and more uncompromising they tend to become. It remains to be seen how Imran Khan’s ‘Naya’ Pakistan is going to address this crucial question. Seethi, K.M. (2014): “Pakistan School Killing: South Asia’s Killing Fields,” Tehelka, , 19 December. Seethi, K.M. (2015): “Political Islam, Violence and Civil Society in Pakistan,” Indian Journal of Politics and International Relations, Vol.8. No.1. BJP MLA Raja Singh allegedly copies Pak song to honour Indian Soldiers! IAF Air Strike: Will Pakistan Retaliate?